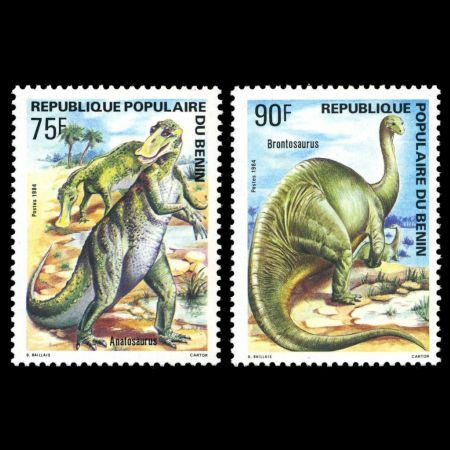 Two stamps depicted dinosaurs issued by Post Authority of Benin in 1984, shows an outdated scientific reconstructions of both Anatosaurus and Brintosaurus, based pn illustration done by famous Czech artist Zdenek Burian. 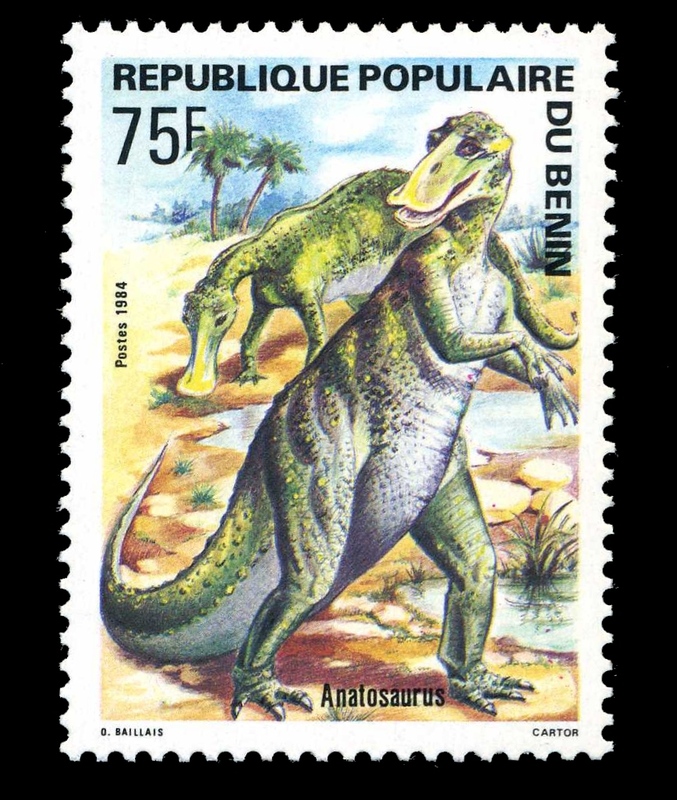 Design of the stamp is based on picture of Zdenek Burian "Trachodon and Tyrannosaurus", painted in 1938, used as Illustration in. "Prehistoric Animals," vintage book published 1956. 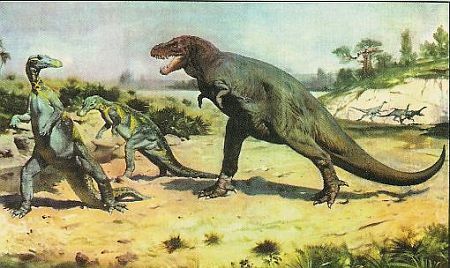 The Anatosaurus or "Duck Lizard" was one of the last large dinosaurs to roam the earth. It flourished during the late Cretaceous Epoch -- about one hundred million years ago. It was a graceful animal which walked on two feet, and ran rapidly with its long flattened tail outstretched. Its body was covered with a leathery skin similar to a gila monster's. A mature Anatosaurus stood fourteen feet tall and weighed three to four tons. It had long powerful legs and large three-toed feet; its forelimbs were slender and had four-fingered webbed hands. Its broad, spoon-bill beak was lined with prism-shaped teeth arranged in alternating rows along its upper and lower jaws. Anatosaurus was primarily a vegetarian who enjoyed browsing on shrubs and conifers along lush tropical riverbanks. Like giraffes, they probably stripped leaves and shoots from branches when feeding. Its large eyes and high, deep nostrils allowed it to quickly sense impending danger. To avoid the huge carnivores like Tyrannosaurus, it probably depended upon its keen senses and speed, but its crocodile-like tail made it a proficient swimmer too. 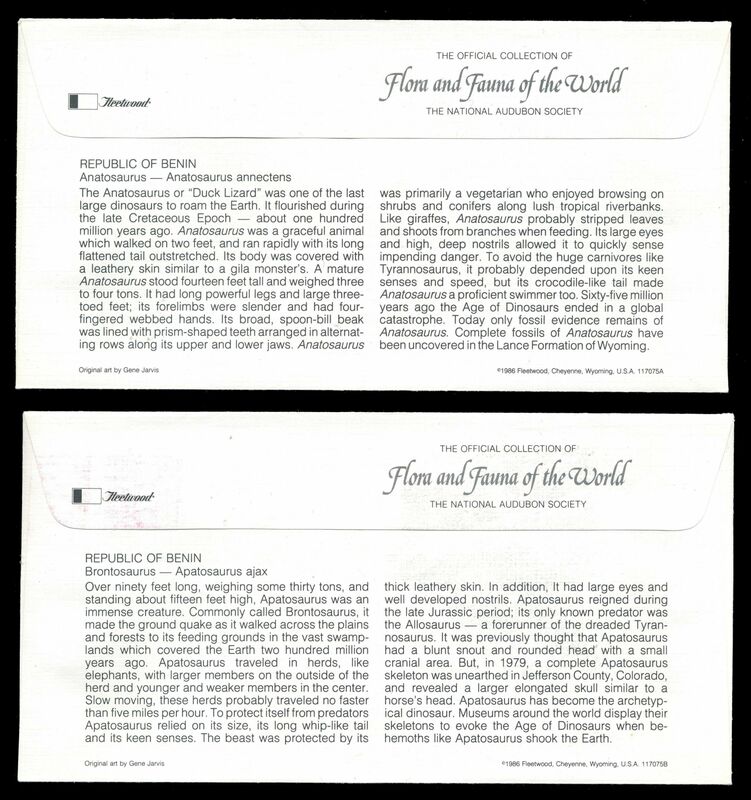 Sixty-five million years ago the Age of Dinosaurs ended in a global catastrophe. Today only fossil evidence remains of Anatosaurus. Complete fossils of Anatosaurus have been uncovered in the Lance Formation of Wyoming. 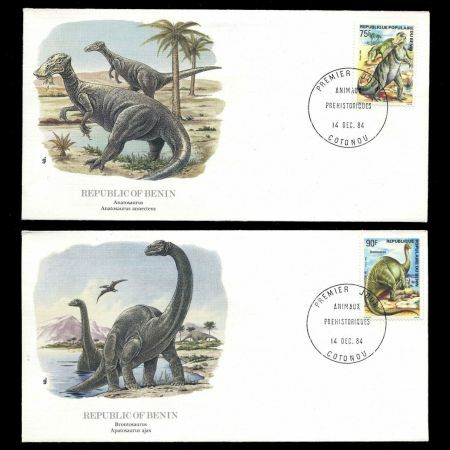 Design of the stamp is based on picture of Zdenek Burian "Brontosaurus", painted in 1950, used as Illustration in. "Prehistoric Animals," vintage book published 1956. 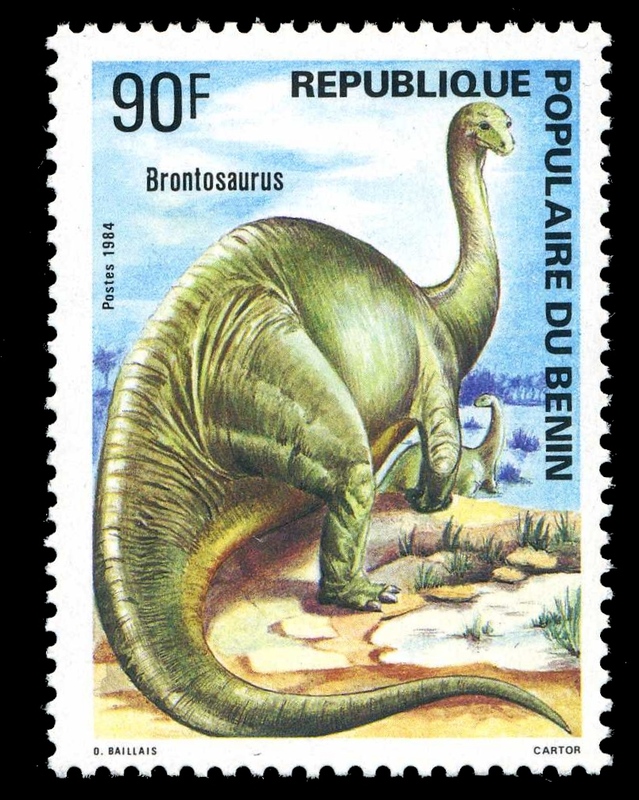 Though it was an herbivore, the brontosaurus numbers among the largest land animals that ever lived. It was so large, in fact, there has been some debate as to whether such an enormous beast could support its great bulk on land, or was forced to dwell almost exclusively in water. 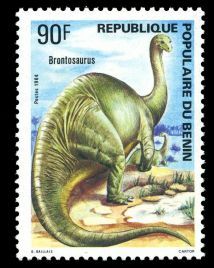 While it is most likely the creature spent a lot of time in the water to help support its tremendous weight, and also took refuge from predators by retreating into the water, scientists now believe that brontosaurus was able to get around on land with relative grace. 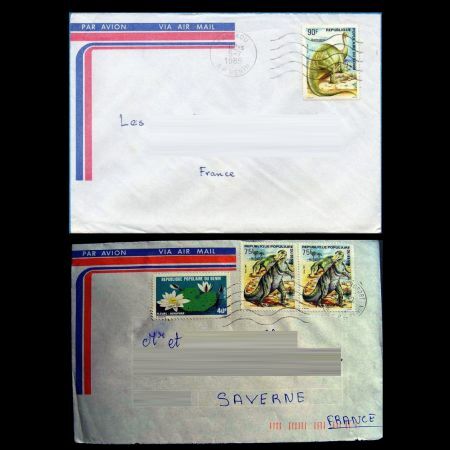 However, it probably represents the maximum size and bulk attainable by a land animal. This huge swamp-dweller stood on four huge, elephant-like legs, and had a long neck and tail. However, its tiny head took up only about two feet of its eighty-foot length. 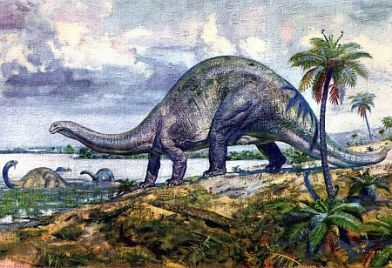 The size, shape and features of brontosaurus' head were disputed by scientists for more than a century after the first remains were uncovered. Incomplete finds, and the possibility of a mix-up of fossils in transit from an excavation site created great uncertainty, and the head was represented in early models as snub-nosed; the teeth, spoon-like. In 1978, however, scientists rejected this representation in favor of a slender, elongated skull containing long, sharp teeth. These teeth may have looked dangerous, but they were really rather delicate and probably only suitable for eating the most tender plants.